Mathematicians Kemal Karaosmanoğlu and Süleyman Metin Yılmaz spent years looking at musical manuscripts of a myriad of Ottoman classical songs and instrumental works found in the dusty archives of TRT, Turkey's first and only state television and radio station. As a result of this meticulous study, they applied the musical notes of more than 1,500 classical works to database software they created, calling the result Mus2okur. The software program not only contains the musical notes of centuries-old Ottoman works, but also their lyrics and information about the composers. In addition, each song in Mus2okur is provided with a “makam,” melodic mode, and “usul,” underlying rhythmic cycle that complements the melodic rhythm and helps shape the overall structure of a composition in Ottoman classical music. “Mus2okur is one of the most successful studies I have ever witnessed and is a unique source for addicts and researchers of Ottoman classical music,” said Periklis Tsoukalas, a Greek musician who specializes in Eastern music. In the early years of the Turkish Republic, Ottoman classical music was neglected to a great extent because it evoked a past tradition and way of life not in line with modernization and Westernization efforts of the young nation state. “We have adopted the notation system of the West and simply ignored our own classical music,” said Karaosmanoğlu. “As we turned our face to the West, we neglected our own music.” Karaosmanoğlu noted that in most Western music, the octave is divided into 12 semitones, while Ottoman classical music features a much more complex range of tones. Mus2okur also contains information on a specific music notation system created by Hampartsoum Limondjian, more commonly known as Baba Hamparzsum, a prominent Ottoman Armenian composer of Turkish classical music. Called the Hampartsoum notation system, the system Limondjian developed became the main musical notation system for Turkish classical music. Limondjian served as royal musician during the reign of Ottoman Sultan Selim III, who was also a musician. Hampartsoum notation uses symbols derived from an older notation called “khaz” used by the Armenian Church in the eighth and the ninth centuries. “The music notation system created by Limondjian is the basic notation system in the history of Turkish classical music. 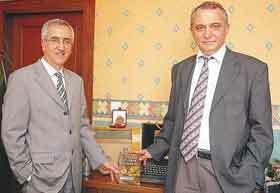 Thousands of old songs are still alive today thanks to Limondjian's notation system,” said Karaosmanoğlu. “This is the reason why we have also incorporated his notation system to our software program,” he said. Mus2okur's rich database makes it a great reference on Ottoman classical music for Western musicians and scholars who are interested in the unique style of music. Karaosmanoğlu and Yılmaz conducted a meticulous examination of thousands of manuscripts of musical notes in the dusty archives of the TRT. “Dating back centuries, these manuscripts were in a very bad condition. Many of them were in tatters,” he said, adding the manuscripts are in need of urgent protection. “Touching those musical notes was a wonderful feeling. They reflect the centuries-old loves and dreams,” said Karaosmanoğlu. “There were a number of Armenian and Rum composers of Turkish classical music in the past centuries*. One cannot mention Ottoman classical music without making any references to those great composers and the great works they produced” he added. For Karaosmanoğlu and Yılmaz, the success of Turkish classical music can primarily be attributed to the peaceful coexistence of different cultures and ethnicities on the same land for centuries. “During a certain historical period, the state radio did not play any works of Turkish classical music in Turkey,” said Karaosmanoğlu, adding this was a clear indicator of the Westernization efforts that marked the period. *This sentence appeared differently in the newspaper. We kindly requested that it be corrected as shown above.